With over 20 years of experience and know-how, our consultative approach to business insures that our solutions are functional, effective and affordable-giving you the greatest return on your investment. From products to services, E&E ExhibitSolutions® is a trade show and event company that knows what works. We are the PEOPLE WITH IDEAS®. Our solutions provide award-winning designs, utilizing portable displays and component-based, reconfigurable, light-weight systems. We are able to lower the size of your footprint and all associated show expenses. All our displays are scalable to include all features you need, such as interactive kiosks, large format graphics, digital and AV presentations, island displays, custom booth rentals, pop-up displays, fabric displays, counters, shelving, storage, conference rooms, hanging signs and more. Utilize E&E® professionals to make your next event successful and memorable! Our experts can help you communicate your message, support your product merchandising and spotlight your guest speakers. Professionally designed graphics effectively keep your primary marketing message on display for your attendees from the stage, reception area, or outside each conference room. Our extensive rental inventory can be customized for your corporate events. Leave the planning of your event program to the experts. 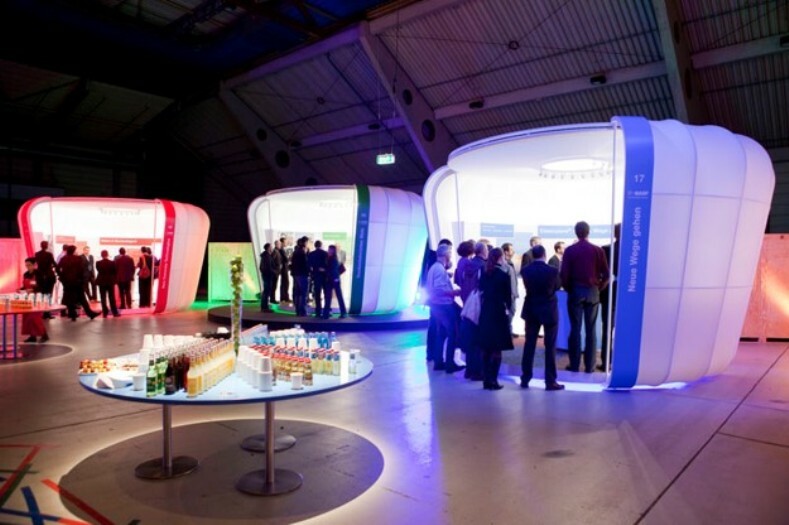 Let us design exhibit structures that communicate your branded marketing. Our professional designers can help you with key visual and verbal placement in order to capture and convey key elements of your business and its benefits. Trade Show and Event Rentals-We will provide you with a viable solution within your budget from a tabletop to an island display. E&E ExhibitSolutions® has an extensive rental inventory with ample accessories to meet your unique needs. Check out our portfolio of exhibit rentals (in authorized states). As a full-service exhibit and event company, our in-house graphic production facility provides us full control from start to finish from file preparation, digital proofing to color management. Our graphic technicians are certified color management specialists. All artwork received goes thru a series of quality checks from proofing, to color management and final production. Logistic Service Solutions and Warehousing-We can coordinate our transportation from event to event, schedule and manage installation and dismantle labor and provide exhibit storage in our climate-controlled warehousing. With over 20 years of experience and know-how, we are a trade show and event management company focused on providing you with a complete solution. Our consultative approach to business ensures that your trade show displays and trade show graphics are functional, effective and affordable, giving you the greatest return on your investment. E&E ExhibitSolutions® has made the Inc.5000 list of the fastest-growing private companies in America for five years. E&E® has been recognized for four years in a row for excellence in service. Click here for more details. For a glimpse into what guides our company, please read our company values.